Academy Award-nominee Klaus Maria Brandauer follows his bravura performance in Out Of Africa with this unanimously acclaimed portrayal of a former Soviet boxing champion who defects to the U.S. after being denied the right to represent his country in the Olympics. Now living in obscurity, the once-famed fighter has become a bitter, disillusioned man. It isn’t until two promising young sluggers, portrayed by Adrian Pasdar (Made in U.S.A.) and Wesley Snipes (Wildcats), persuade him to be their coach that he begins to regain his self-respect. Fueled by the passions of the ring, Brandauer pushes the two fighters to their emotional and physical limits. When the two boys have the opportunity to fight the Russian team coached by the man who refused to let a Jew represent the USSR in the Olympics, Brandauer get his once-in-a-lifetime chance for retribution. 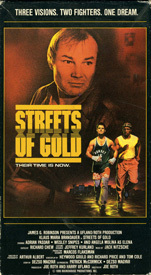 They each have different dreams, but share one goal…to reach the Streets of Gold.